Sirius GT Construction Accounting is a Full Featured (true 32-bit) modular Accounting and Job Costing package designed specifically for the Construction Industry. Sirius GT Screen Shot w/ Management Overview & Management Analysis. Demonstration CD Ease-of-Use, Attention to Detail, Exceptional Job Cost and Financial Reporting with Drill-Down and Analysis features have made Sirius GT an Industry Standard for Construction Management Systems. Each of Sirius GT's Sixteen (16) integrated modules was specifically designed for contractors. Specialty contractors, in particular, will find many features, reports and entire applications not available in any other construction software accounting system. With offices and training facilities in Ohio, Texas and Florida, Sirius GT is sold through a nation-wide network of Authorized Sirius Resellers (ASR's) with thousands of satisfied customers and referrals. Many of our Dealers have over fifteen (15) years of experience with construction software accounting systems. Auto-Fill invoice entry from Purchase Order information - Automatically checks paid, unpaid, entered but not yet posted invoices and balance left to pay on each line of an invoice so that you will never over-pay a supplier or subcontractor. Post invoices to multiple jobs, phases and/or General Ledger accounts. The hub for multiple billing formats and detailed customer records. Available information goes far beyond standard aging and payment reporting by analyzing sales history and profitability by customer, job, revenue account, sales rep (estimator or foreman), items purchased, etc. Automatically send customer statements via Email. Included with General Ledger, Bank Reconciliation enables you to monitor and control, on a daily basis, up to 15 bank accounts per company, maintaining your account balances, check detail, deposits and miscellaneous transactions. Reconciliation with your bank statement is made easy with the on-line transaction check-off. Unique module that allows you to quote customers (interfaces to Inventory Kits) and transfer material orders directly to Order Entry. As a marketing tool, you have the ability to track contacts for current or potential customers, generate selective mailings, maintain detailed notes on potential and existing customers (interfaces to Accounts Receivable). Tracks job site location, depreciation schedules, billing and detailed cost information (fuel, repairs, depreciation, labor and services performed) for each piece of equipment. Automatically creates usage logs from operator (Payroll) time sheets. Detailed operational cost/profitability reporting. Fast and easy to learn estimating system with detailed assemblies, labor factoring to material units, duplicating from existing estimates, update previous estimates with current pricing, detailed take-off reporting, etc. Estimating database prices can be automatically updated from inventory. Transfers estimates to Job Costing and Item (AIA) Billing. A Universal Import feature included with Job Costing for importing information from other 3rd party estimating programs. Produces professional looking departmental Profit & Loss Statements, Balance Sheets and Consolidated Financial Statements. Customize financial statements with built-in Report Formatter. Includes Budgets, Variances, Ratios and Comparisons of Current and Year-to-Date. Maintains detailed billing history while producing industry standard G701, G702 and G703 AIA Billing documents. Added feature allows Unit Pricing within the Schedule of Values along with the standard cover sheet. The material database hub used by Purchase Orders, Accounts Payable, Service Manager, T&M Billing, Equipment Control, Contact Organizer (quotations), Order Entry and nearly all of Sirius GT's other miscellaneous billing formats. Can be used to update Estimating database prices. Multiple locations (Shop, Truck1, etc. ), detailed purchasing history and easy transfer to/from jobs are just a few of the many features of this flexible material handling application. The Science of Job Costing is to bring together all of the contracts, estimates, expenses, billings, and purchases (committed) from all facets of the Sirius GT Construction Accounting System. The Art of Job Costing is in the dozens of carefully crafted Job/Phase/Audit Reports, the Ease-of-Use of the built-in Job Cost Report Generator and Drill-Down On-Screen queries. 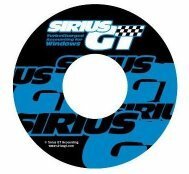 Maintains Sirius GT's unique user-defined menu structure, security settings, backup/restore functions, special printer controls, along with Management Overview and Management Analysis. Access company-wide phone directories, appointment calendar with reminders, user emails, detailed To-Do lists and other useful features with one mouse click. Controls orders, shipping, backorders, committed and on-hand inventory, multi-level discounts, special promotional pricing and recurring order/invoice generation with user-defined setup procedures. Often used by specialty contractors that sell or lease items directly to customers and by subcontractors that need to easily transfer large amounts of inventory (user-defined kits) to jobs on a regular basis. A complete and comprehensive construction payroll system with special features like remote processing, five (5) Certified Payroll report formats, comprehensive union (benefit) reporting, multi-year check history and multiple pay frequencies (weekly, biweekly, semimonthly, monthly), just to name a few. Prevailing wage requirements, multiple state & local taxes, 3rd part insurance sick pay and full federal, state and local reporting are just some of the features included with this application. A flexible, easy-to-use system that works seamlessly with Accounts Payable, Inventory and Job Costing. Designed for use by the 'accounting challenged' types, it is very popular with operators and owners alike. Items can go to different jobs, phases and/or inventory accounts on the same purchase order. Search summary or detailed information by PO number, Job, Customer, Supplier, Inventory Item, Buyer and Requisition/Department number. Monitors the status of every work order from inception to completion and billing. Easily identify lost paper work and scheduling conflicts Maintains unlimited history of reported problems, work performed and billing information by customer and location (multiple location). Generates inspection work orders and maintenance contract invoices. Uses a Drag & Drop Whiteboard to easily monitor/adjust technicians and work orders. A versatile and flexible billing system that is far more advanced than similar 'sounding' applications offered with other accounting or estimating packages. Information can be manually input or automatically transferred from job cost. Choose from four (4) distinct billing formats; Fixed Price, Percent Complete (mini AIA type), Inventory Look-Up and T&M (a/k/a/ Cost Plus). User definable invoices can print with varying degrees of detail (February 8, 2003 - Bill Jones - Electrician - 8 hours - $65.00 Hr for $ 520.00 or simply Labor - $ 520.00) depending on customer requirements. Sirius GT is a fully integrated modular Construction Accounting System. Purchase only the number of modules that you need. Start with two or three applications, and add-on more as needed. Single-user applications can easily be upgraded for multi-user networks.